This past weekend was full of card making craziness! I spent Friday evening coloring images for the upcoming Newton's Nook Designs February Release and then I spent time on Saturday and Sunday putting the cards together. I can't wait for you all to see the new stamps and dies that are part of the next release. You are going to love them! Until the reveal for the new goodies, here's a little Newton's Nook love for you. I'm sharing a card I created for Inky Paws Challenge No. 40. The new challenge is a sketch challenge. I love sketches and couldn't resist playing along using the Pug Hugs stamp and die set. 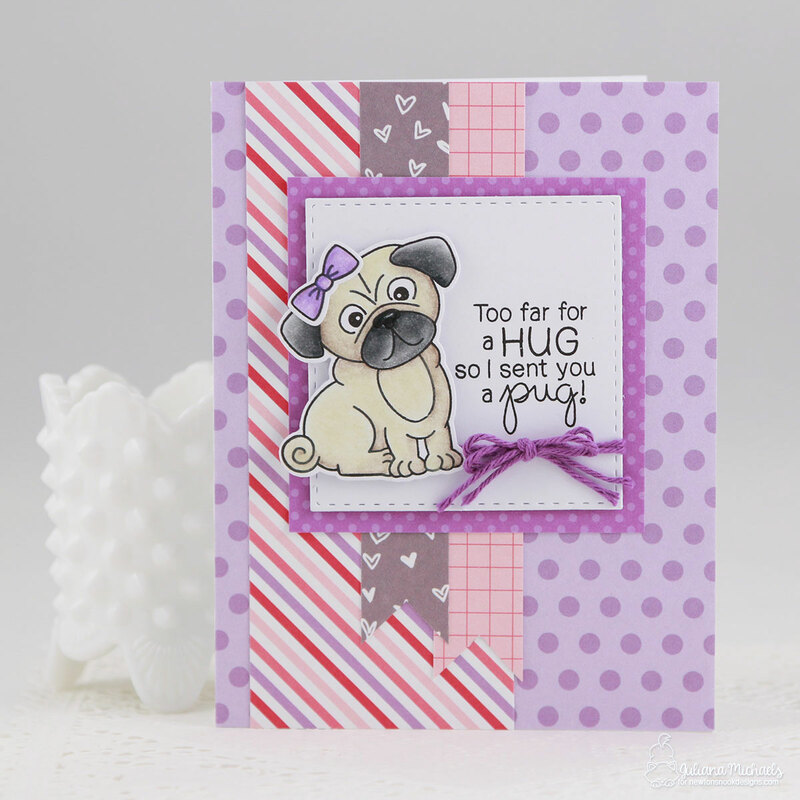 The cute little pug is stamped with Versafine Black Onyx and then colored with Prismacolor Colored Pencils. I blended the pencil with Gamsol and a blending stump. 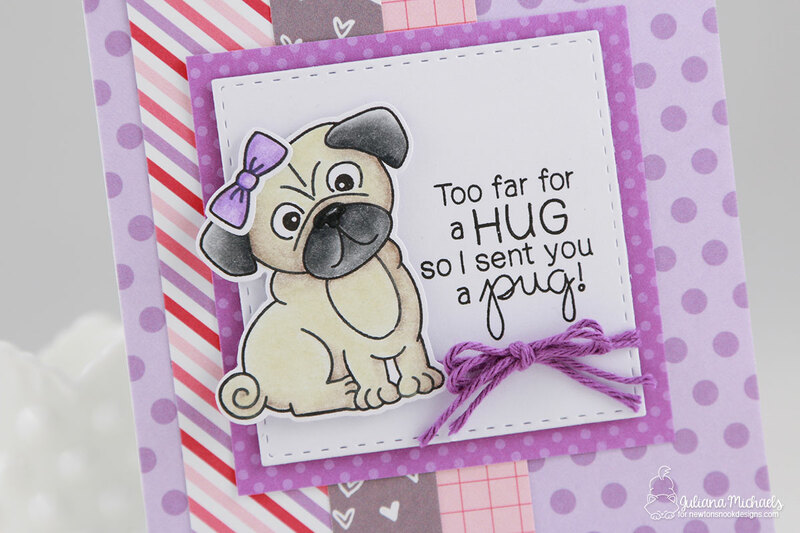 I then used the coordinating dies to cut out the pug and then added a cute purple bow! The purple bow inspired me to use some patterned paper from my stash - Elle's Studio Little Moments 6x6 Paper Pad. It had some purple in it that was just perfect for that cute pug! If you aren't familiar with the Newton's Nook Inky Paws Challenge, let me share a bit about it. They have 2 challenges per month and they start on the 1st and 3rd Monday of each month. 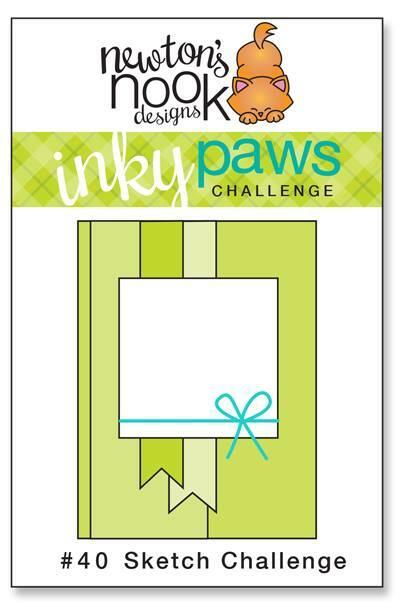 The Challenge winner is selected from all of the challenge entries and they receive a $10 store credit to the Newton's Nook online store and an Inky Paws Challenge Top Pick Badge to add to their blog! You can find all the rules for playing along on their blog (here). Now, it's your turn to play along. I can't wait to see what you create and share! This is the best little pug dog ever!